It’s started early tonight and the small yet loyal clan of followers are seated at tables. The audience consists mainly of men, the majority of which are bespectacled and lacking in hair. Jonatha knows two members of the crowd, the second not well enough to remember his name: “Dave? Michael?” She should be embarrassed here, at this public clutching at straws, but she isn’t – she giggles, glances coyly to the heavens and moves on, electro-acoustic in hand. Actually, it’s this nonchalant confidence that makes the performance. She plies Radio 2 drivetime friendly soft-rock, with Alanis Morrisette vocals and Meredith Brooks punch. There’s a bit of Sheryl Crow in there, too, with the breathy delivery. So although Jonatha Brooke is not musically astounding, and some of the lyrics verge on downright cliché, she is comfortable with what she does and comfortable with how it will be received; which, in this instance, is favourably and fondly. 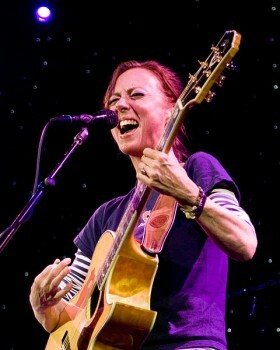 And when her string snaps just as she is tuning up for the penultimate track of the night, her audience breathe a collective sigh in awe as she playfully exclaims to her band, “I’m not going to play that stupid guitar, you play it!”, proceeding to revel in the final two songs by dancing animatedly about the stage.